​This book is hard-bound of 168 pages in 8" x 11 1/2" page format. The cover art shows a Fokker D.VII in markings for Jasta 46, over a skeleton of a D.VII, a color illustration of a Carl Bamberg Armen Kompab IV meter with a standard Carden bracket (whatever that is ?? ), and a black and white photo of machine guns. World War I was the time of dynamic development of aviation. Aircraft created during that period and pilots who fought in them, became legends that have fascinated generations of pilots and aviation enthusiasts. Legends of Aviation in 3D is a publishing series with a goal to present legendary aircraft from the pioneer era of military aviation in an innovative way. Thanks to color 3D rederings you can almost touch the Fokker D.VII, see its details, get to know its meticulous airframe structure and understand the phenomenon of this legendary aircraft. With the virtual Fokker D.VII, Marek Rys inspires us to explore the history of the aircraft afresh. The modern 3D images impressively harmonize with the old photographs. Tomasz Kowalski tells us the story of pilots flying the new Fokker biplanes and takes us to the dark and romantic period of the Great War when knights of the sky were born and killed. Tomasz Kowalski and Marek Rys publication is a valuable addition to literature concerning the legendary Fokker D.VII and simultaneously a successful and exceptional attempt to present the earliest history of aviation in an original way. The book makes all efforts to make the layout and quality of the series fulfill the reads of readers. Thomasz Jerzy Kowalski has a degree in physics and computer science. He has been fascinated with aviation since childhood. His main interest is the history of aviation, especially aircraft painting schemes and markings. He is the author of 23 books and over 1,500 articles about the history of aviation. Kagero has published 8 of his World War I aircraft monographs. This is the ninth publication. The total edition of his publications has reached 380,000. Marek Rys graphic designer and aviation publicist, author of more than a dozen books on the history of aviation technology and several hundred illustrations, technical drawings, covers for numerous magazines and publishing houses. Apart from aviation, his interests include films, books, music and playing the guitar. The book contains a set of cardboard glasses with one red lens and one blue lens to use to see the 3D illustrations. ​There are 110 black and white photos in the book. These include: the V.11, V.I, E.I, V.18, V.9, V.11.II, V.22, V.34, V.36, V.38, C.1, D-VIII F versions and the Halberstadt C.V. The bibliograph, end-notes and appendixes are in the center of the book, rather than the usual place at the end of books. There is a victories list and pilot's names. Included are 29 line drawings of the Fokker D.VII in 1/72nd scale and its parts. There are 170 3D color illustrations showing every last inch, inside and out, of the Fokker D.VII. There are 14 3D color illustrations of the D.VII in markings for Jasta 35b, flown by Ltn. D.R. Randolf Stark. Nine 3D color illustrations of the D.VII in markings for Jasta 46. Eight 3D color illustrations of the D.VII in markings for Jasta 50. Nine 3D color illustrations of the D.VII in markings for the 13th Eskadra Mysliwska, Polish Air Force. Also shown are 2 color illustrations of lozenger patterns. The last page of the book has cover arts for Kagero's books on: The S.E.5a, Albatros D.1-D.Va Legendary Fighter, Sopwith Camel, Fokker Dr.I the Ace's Aircraft. 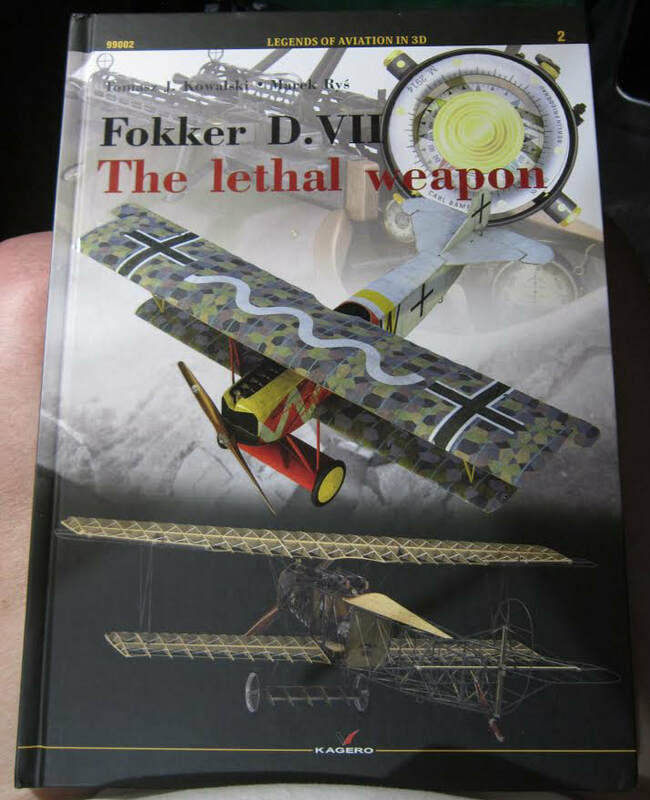 This is one neat book on the Fokker D.VII. It will be of great interest to modelers and aviation enthusiasts alike. I want to thank the folks at Casemate Publishing for this sample and Kagero also.